CUFI Executive Director, Des Starritt, together with our campaign partners have delivered over 10,000 names to Downing Street today calling for the Prime Minister to stop the antisemitic ‘Israel Apartheid Week’ and enshrine the International Holocaust Remembrance Alliance (IHRA) definition of antisemitism into UK law. The delegation was joined by MPs, Joan Ryan (Labour), Matthew Offord (Conservative), Jim Shannon (DUP) and Nigel Dodds (DUP). 10,541 signatures were delivered to Number 10 – a fantastic outcome and demonstration of the strengthening pro-Israel support in the UK. CUFI would like to thank the more than 3,100 supporters that joined the campaign. 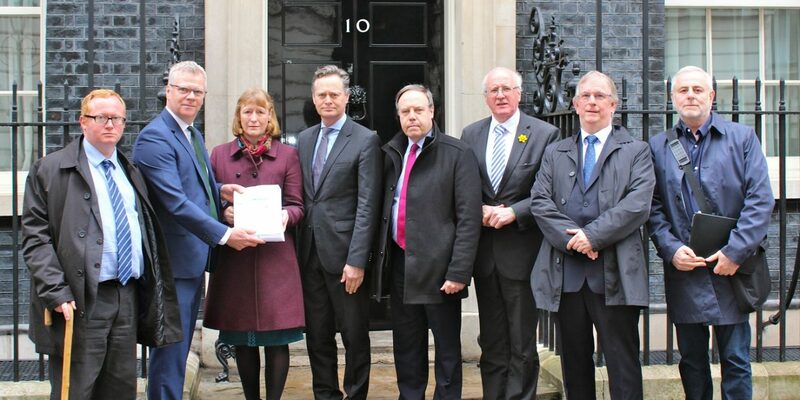 Photo: Left to right: Luke Akehurst (WB), Michael McCann (IBA), Joan Ryan MP, Matthew Offord MP, Nigel Dodds MP, Jim Shannon MP, Des Starritt (CUFI) and Simon Cobbs (SFI).